One of the nicest ‘concepts’ taught to children nowadays for Communion is that of connectedness. My youngest daughters both sang a lovely hymn at their Communions, called ‘Connected’. 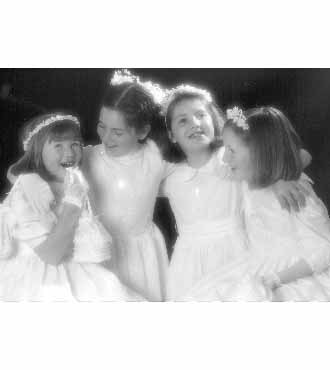 Long before this was introduced formally, back in 1996, Paul captured ‘we are all connected’ in this beautiful shot of eldest, Carla (third from left) and her friends on their Communion Day! LOL., great post, it's that time of the year again. We have confirmation this year and we will be taking a leaf out of your book and going out somewhere. Now, can someone please explain to me what 'bouncy castles' have to do with Catholic Church sacraments? They'll have them at funerals next. I totally agree with you B, and think we will see less excess with the death of the Celtic Tiger, back to the Zoo for all of us, much better. Beautiful photo of the girs ! Great post! I'm not Catholic but I love hearing about all the rituals and how things have changed. Maybe we will say goodbye to the fake tans, tiaras and limos too! When Robin's grandfather died the night before his communion the 'do' had to be cancelled and I grabbed some young cousins and we headed to the amusements in Bray. Dodgem cars, waltzers, slot machines and a bag of chips – and one little boy who said he 'had a brilliant day!'. We forget sometimes how easily pleased children can be and that it is the wide circle of adults that we are trying to impress. Where is your beautiful photo of your own First Communion in Wynberg park I know you have it!!!! Loved the blog and it brought back memories not only of grandchildren's Communions but of course my children's and also of my own which took place during wartime. I remember the hassle my poor ma went through trying to get material with which to make The Dress. I think I must have had to borrow the shoes because a few days after the big event it suddenly dawned on my mother that they had forgotten to take photos. So I got back into my finery and was tastefully posed in the back garden but with assorted greenery spread around my feet to disguise the fact that I was wearing Clarke's sandals! Ah, happy days. Hi Brigid… glad to hear u are taking the stress out of the day by going out. Enjoy! Hi Talli – nice to have u at my kitchen table and glad you enjoyed the post about Communion madness Irish style! Hi Mol – you and Bray.. u sud be paid by the town council for always singing its praises. But I am sure that Robin loved an afternoon at the amusements. And that photo is on the wall in my hall for all to view as they enter my house! And right beside it is Noirin's photo complete with hidden feet… thanks for hsaring the memories Nor! This was so interesting! I grew up Methodist so we had a form of communion when we turned 12 but it was nothing like this. No big deal really, although I remember taking classes and getting a new dress. No part though. That party with your daughters sounds way more fun than having hoardes of people at the house. I'll bet they loved it too, and I bet they felt special that their party was just a bit classier! Beautiful photo Barbara. Communions are a thing of the past in our household. Our Irish communions, we and extended family headed to the local Country House Hotel for a meal. It was the most I could manage with a house full of visitors and three and eventually four small children. The American and last communion, had the large party at home. No country house hotels to retreat to here! What a wonderful way to relieve the stress and excitement of the day…a swim. I left the above comment ages ago, I must have forgotten to do the letter thing!!! It seems to be just one of those days. I really enjoyed reading this – I don't know anything about the rituals and traditions, but it's so interesting hearing about it. And what a beautiful photo of Carla and her friends! Hi Karen – thanks for the comment. Its great to get an outside view. I am trying hard not to be judgemental of others way of doing things… but there is a lot 'over the top' done mainly by the parents. I am not sure that our event was classier (some of the parties are very classy affairs) but it was fun and relaxing. And we all enjoyed it! Ann – am so glad you liked the photo – its one of my very favourite and Carla is still best buds with all the girls pictured. And I remember that country house hotel you refer to – I am sure it was the same one Siobhan had her Wedding Reception in! Ahhh memories! Ah Jayne – apologies – I only noticed your message after I had posted my response. Welcome to the kitchen table… and glad your liked the post and the photo – which is one I love very much! It's so different where I live. In Ireland the church is much more a part of everyday life. When I was a child, I remember being pulled from public school to go to the church once a week to get ready for my communion. We were definitely in the minority in my classroom. I went to the Zoo for my Communion too – way back in 1974! I can still remember the excitment!